1. Texting, Emailing, You Tube, Instagram, Facebook, Snap Chat; Our library is no longer AT the library, its at our fingertips and so is our social life, work life and our kids life...even sometimes our private life. 2. Your kids watch every move you make. How you drive with your phone, your kids will drive the same way except they are not as experienced as you... does it matter? An accident IS AN ACCIDENT! It only takes a second. Was the text worth it? The Call? Your kids didn't know the dangers, "if mom did it while she was driving, its safe for me to do too". 3. Your kids are too young, they don't know the difference in the car? Really? How about the young driver that just hit you because they had the phone in their hand the same way you did? Did your kids in the back seat see that? Stay off the phone in the car. 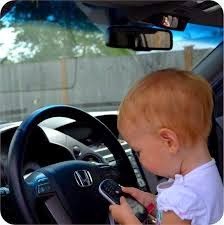 Stay focused, your kids will do the same when it does come time for them learning to drive.